Most marine creatures that pass our coast prefer to go un-noticed – but not the humpbacks. These massive mammals like to announce their presence with spectacular displays that still leave scientists guessing as to why. Certainly whales need to surface to breathe – their huge exhalations rising metres into the air after 20 minutes of down time underwater. But the humpbacks have turned airtime into an artform. Giant pectoral fin slaps, tail splashes and spy hops (poking their head out to look for an appreciative crowd) are just the precursor to the main event. Full body breaches are the show stopper for any whale watcher. And the degree of difficulty needs to be fully appreciated. An adult can easily measure 16 metres and weigh up to 30 tonnes and to launch something of that size out of the water (often time and time again) is nothing short of astounding. But to what end? 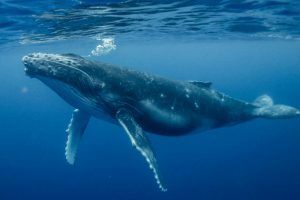 It’s not a way to flee predators or to capture food – humpbacks are on an enforced diet during their time away from Antarctica – their preferred menu of krill remains in the icy waters while the whales make their annual pilgrimage to mate and calve in the warmer region of the Pacific. The most plausible theories to explain the unusual antics are guesses at best. One thought is the breaches and slaps are a form of communication – a way to let other humpbacks in the vicinity know where they’re at. Another is it signifies a change in behaviour – when a whale is going for rest mode to more active travelling – like a giant stretch as they wake themselves up. But many believe they just do it because they can. Humpbacks are known to be curious, intelligent animals and like most mammals they are capable of having fun. They leap for joy simply because it feels good. In the past, this playfulness has contributed to their demise, with the species almost hunted to extinction in the early part of the 20th century as they were easy prey to spy. Today the biggest threats are net entanglements and strikes from over zealous boaties wanting to get as close as possible to these magnificent creatures. But we all play our part – with Plastic Free July upon us, it is the perfect opportunity to consider our impact on the ocean and the quality of the water the humpbacks and so many other marine creatures swim through. Don’t be fooled by their size and energy, these really are our most vulnerable visitors and the southerners we want to keep returning for many years to come. This entry was posted in Uncategorized on July 4, 2018 by oceanlifeeducation.